Everyone who has seen Mark Knopfler live on one of his recent tours might have notived that cool-looking turquoise combo amp next to Knopfler’s Marshall cabinets. Knopfler’s second guitarist Richard Bennet also plays one. It is the Tone King Imperial. Tone King amps are built from selected quality parts by Mark Bartel in Baltimore. Mark does all the woodworking, upholstery, and electronics assembly himself to have total control about the sound and quality of his products. The Imperial is a two-channel combo with reverb and tremolo. The output power is about 20 watts, coming from two 6V6 tubes. The two channel make use of 12AX7 pre-amp tube, and one 12AT7 driving the reverb, just like Fender amps from the sixties or seventies. In fact it reminds me a lot of a black-face Fender Deluxe amp, which also has a similar layout and one 12″ speaker. In fact you can read on the Tone King website that the rhythm channel aims for that Fender black-face sound. A volume, treble and bass control is all that is required here. 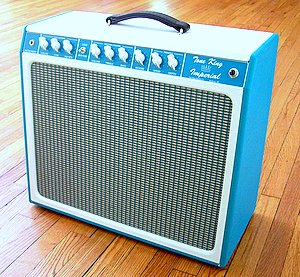 Of course the spring reverb – a fundamental ingredient of the Fender sound – works for both channels (note that on Fender amps it only affects the second channel). It will not surprise you that the reverb circuit uses the same two-spring reverb tank (acutronics) and the same tubes like Fender. The second channel also features just three controls: volume, tone and mid-bite – so no bass and treble control here, just on a small Fender tweed amp from the 50ies. The mid-bite adds a midrange peak and tightens the low end, controling the overdrive tone character that can be blended from Fender tweed to Marshall style. The speaker is custom designed and labelled with ‘Tone King 33’ – manufactured by Eminence (who also built the speakers in most silver-face Fender amps in the 70ies and 80ies). The recommended retail price for the Tone King Imperial is 1995 USD. More infos on toneking.com. On the last (2008) tour Mark Knopfler played his red Schecter Telecaster on the song Cannibals through the Tone King Imperial, his ’54 Stratocaster on the song Our Shangri-La, and his signature MK Strat on Postcards from Paraguay and True love will never fade. I guess it is the ‘king of clean’ for him and that he hardly ever uses the second channel. Another song to feature this fine amp is Hard Shoulder from Get Lucky (played on a Gretch 6120). The Tone King Imperial on the 2008 tour. 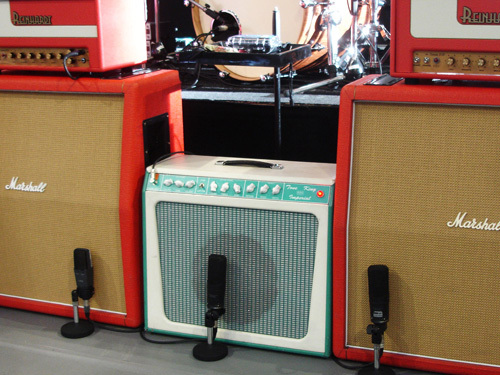 The red Marshall cabinets were driven by two Reinhard amps. 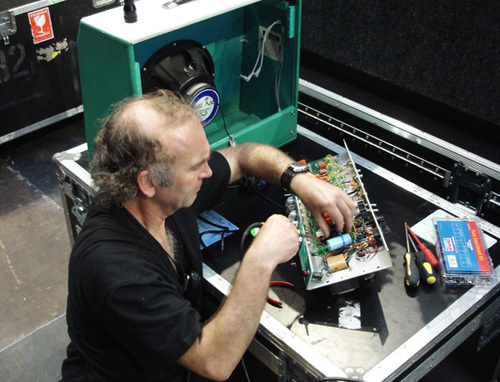 Technician Colin Barton working on Mark Knopfler's Tone King Imperial. Pictures courtesy Guy Fletcher. Which songs of the Get Lucky tour are played with the Tone King Imperial? And what was the amp setting? Tone King Imperial: Played on which songs? I have the Tone King Imperial in red color for 2 years now and I can confirm that this is a great amp. The sound is really Fenderish on rhythm channel and more tweedy on the lead one. The lead one is much more loud than the rhythm channel and with the mid bite control to zero changing from rhythm to lead is an interesting way to boost the sound with minimal change on the sound. The channel switching works fantastic, smothly, with no noise at all. The tremolo is bias modulated so it is the smoother tremolo I have heard and the switching is also completely transparent. However you has to plug the two-button footswitch (channel and tremolo) to stop the tremolo as it is working always by default if the footswitch is not connected. Another interesting feature is the weight of the amp. With only 30lbs and 20 Watts this is the perfect amp to move around without hurting your back. For readers reference, the Fender ’65 Deluxe Reverb reissue is 42 lbs. However the finish is like a soft tolex very easy to tear, so it requires some care to avoid damaging it. My only concern was that the amp was a little too bright and the lows were not as tight as on the blackface amps. It was incredible great for getting that Tele twang or to play humbuckers like Les Pauls but I wanted a fuller sound with the Strat. You can see what I meant in these Youtube links “http://www.youtube.com/watch?v=TBaPoK-6zoc” and “http://www.youtube.com/watch?v=IkwGlFIuwnU”. So I decided to order a Weber 12F150 50W speaker light dope (the one Weber Speakers recommends for a Deluxe Reverb replacement) and swapped the speaker last week. The result is exactly what I was looking for: a closer sound in my opinion to the Fender backface sound with tighter bass, mellow response on the top end and more “in your face”, powerful sound. So now I can get different tonalities just changing the speaker!! Totally agree with hoe great an amp the TK imperial is. Changing out the speaker to the weber 12F150 w/light dope is a must as well! We don’t know much about the Communique amps (see the page ‘gear on all songs –> Communiqué’ under Pages in the side bar). I remember that years ago I met Jack Sonni at the Frankfurt Music Fair, and asked him what amps Mark played on that old Dire Straits stuff. He said “I believe an old Deluxe or something” (which is 6V6). No idea in how far this can be regarded as confirmed info, but I admit when hearing this I “saw” something like a black-face Deluxe Reverb on Once upon a time in the west in my fantasies. Ingo, will you choose it over a vibrolux reverb? I think such a question cannot be generalized. I admit there are surely some vibrolux incarnations (e.g. a black face with yellowed front grill) that would make feel tempted. On the other hand, a new amp of the quality like the toneking will never be a mistake, it is surely more reliable than a vintage amp. Knopfler can afford both but decided for the toneking on stage! I have been playing and copying Dire Straits since 1978 and I can assure you that a small tube amp like the Fender Vibrolux will do the job. I add just a little compression and digital (Alesis)reverb. 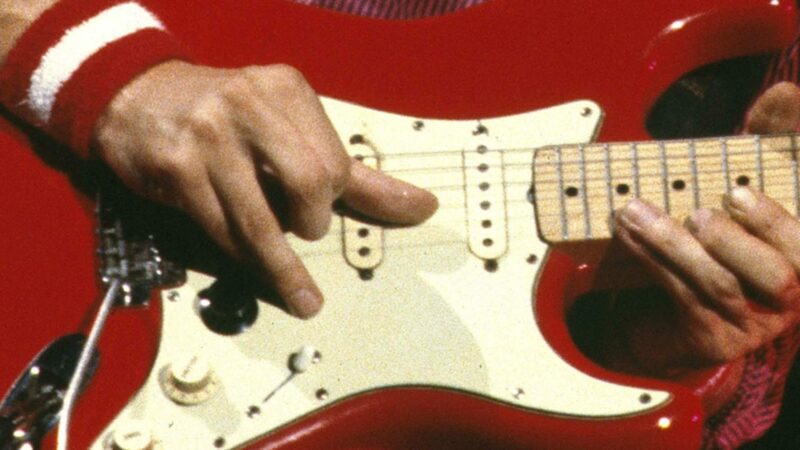 The equipment is one side of the story, another condition is that Knopfler plays with his bare fingers (except for recent years), which is probabely even more important than his equipment. Knopfler often ‘squeezes’ out notes, but says he doesn’t use his fingernails. His sound emerges from the flesh of his fingertips, giving him the possibility to create wild dynamics but also to dampen his strings when necessary. Keep up the good working! Really Harry? I use a blues junior now and while I use my fingers as you said the tone is close to that but not exactly the same. That’s why I am in dilemma between the vibrolux and the deluxe? Have you tried them both and like more the vibrolux? I’m talking about the 2×10 vibrolux. I use two amps linked together: a Vibrolux 2×10″ model, silver face, about early seventies. Couldn’t afford or find a blackface. Next to the Vibrolux I use a Mesa Boogie IIc, 1984, rhythm channel, Electro Voice speaker, in short, a happy combination: the Vibrolux gives a very bright sound and the Boogie adds the mellow tones. But now for something completely different. I remember that, in the early days of Dire Straits, lots of speculation was in the air about how Knopfler got his typical sound. Some music magazines even suggested that he used the Direct Input method, which means that no tube amp was used at all! Ok friend, but how then his tone have so warmth without being a tube amp? I thought a vibro like yours will has plenty of warmth. Some say the deluxe is sweeter because of the 6v6. I like your infos. Thanks for your comments. Hank B. Marvin once stated in an interview that the combination Strat and Twin Reverb needs a bit more warmth, it sounds too thin.That’s way he uses a Vox AC 30. But when you use a Vibrolux, the sound will be thicker and warmer than a Twin, due to its lower output. When a little compression is added, your sound will turn brilliant and creamy at he same time. Be sure not to add too much compression, try to avoid the “click” that can be heard at high compression rates. I haven’t played a Deluxe yet, maybe I should try one. Sultans of Swing: brown Vibrolux (1960-1963), played with a Orange Squeezer compressor pedal. AnalogMan makes a reincarnation of this odd compressor called the Juicer. It’s a compressor with more ‘mojo’. In my opinion, a blackface Deluxe (snap the bright cap! ), or BF/SF Vibrolux will do the job too. A little compression is a must! (Demeter compulator is a very mild compressor, Analogman end Keeley ‘old school’. Agreed that any old style Fender amp sounds great for THAT sound, especially the small to middle sized amps. Just saw some video’s from the 2009 Prince’s Trust gig the other day. As for amps I only noticed a white/blue Tone King Imperial! Do you think MK used it for the overdriven sounds like on Money For Nothing, Brothers in Arms? I HAVE BEEN TRYING TO RECONNECT WITH COLIN BARTON FOR SOME TIME NOW. WE GO BACK TO HIS DAYS WITH CHRIS THOMPSON AND MANFRED . HE USE TO STAY WITH OUR FAMILY IN AVON LAKE OHIO WHEN IN THE US. IF YOU SEE THIS COLIN …… PLEASE GET IN TOUCH. THE LAST TIME I SAW YOU WAS 1980 AT THE NBC ENTERTAINMENT CENTER IN LOS ANGELES. YOUR OLD Di Fiores friend FRANNY SWARTZ.